MikroTik NetFlow support and configuration is a two-step process that can be achieved in a Command Line Interface (CLI) or a Graphical User Interface (GUI). NetFlow reporting is available on all their devices running MikroTik RouterOS v2.9, v3, v4 or higher. 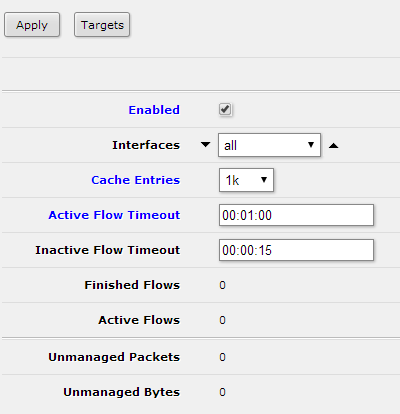 The MikroTik NetFlow configuration guide that follows was configured using RouterOS version 6.11. Let’s jump into the configuration! This will list all the collectors that have NetFlow being sent to them. You could also specify the version 9 refresh and timeout templates. 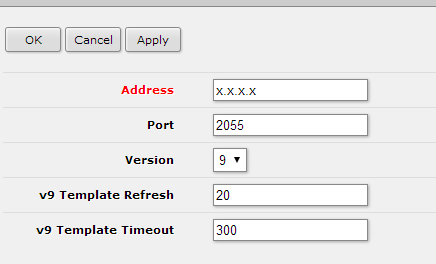 The template-refresh is the number of packets before the template is sent to the receiving host again. The number of packets is defined as an integer value, which by default is 20. The template-timeout is how often the template will be sent, in minutes, if the max amount of packets has not been reached. Typically this is set to 5 minutes. Similar to what was done in the CLI, enable NetFlow and fill in the fields for the interfaces to be monitored, cache entries (the number of flows in the router’s memory at one time), active flow timeout, and inactive timeout. After you have configured the settings in the above screen capture, press Apply. The created collector will now show in the target list; ensure that it is enabled. Once setup is complete, NetFlow reports will be available in the collector. Looking for more MikroTik NetFlow support or how to configure other network devices for NetFlow reporting and network visibility? Please comment below if you have any questions or came across any issues configuring your MikroTik Router, or reach out to our support line at 207-324-8805 x4. Austin is a QA Engineer in the R&D department at Plixer. He works on new report types and aids the front end team with changes to the user interface of Scrutinizer. He has worked in Tech Support as well as a Solutions Engineer for the sales team at Plixer before his move to Development. Austin graduated from UNH’s WSBE with a degree in International Business and speaks a bit of German. Outside of work, Austin spends his time honing his coding skills and does website design for friends and family. He enjoys skiing, hockey, playing and writing music as well as traveling to different countries.